Computerized Embroidery of Yesteryear – Well Sort Of! Did you ever wonder how embroidery was done before computers? During the 1960s automated embroidery was done using machines that operated by coded instructions on a 3”punched card, called a jacquard. The concept of operation is similar to that of a player piano. The card was transported through a device called an automat, and the pins of the automat either went through the holes or were held back where there was no hole. The pattern of the holes in the jacquard determined the action of the pantograph that held the hoops. The holes in the card are the reason that digitizing was called “punching” during that time. 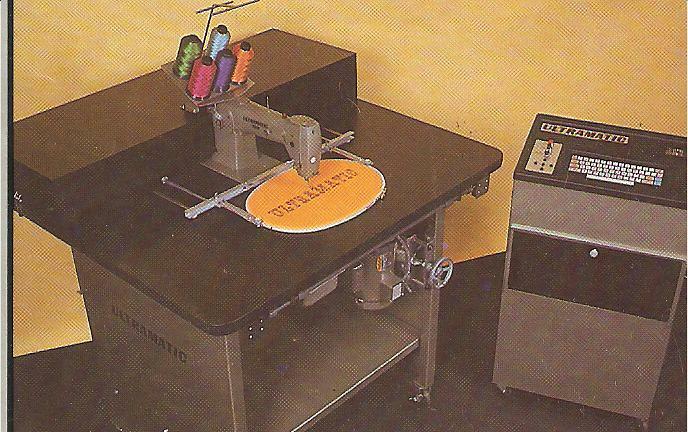 During this time, multi-heads were the most popular because these machines were used for production embroidery. The machines had only a single needle bar and thread changes were accomplished by tying a new thread color onto the old one and pulling the thread through the needle. Because of the physical requirement for the pins to move in and out of the holes, the speed of these was machines was very slow- about 250 stitches a minute. The card could be glued together to form a continuous loop, but in most cases they were rewound by hand after each cycle or “run”. machine. And to think- today we accomplich the same thing with a small flash drive! Of course, then came floppy discs, keyboard lettering, automatic trimmers, cap frames, on-board monitors and the many other convenience features we enjoy today. Thankfully the equipment manufacturers have continually made improvements to reach the level of quality and ease of use we enjoy today. Thanks to each and every engineer and technician that has played a part in making this happen! You can only appreciate what you have when you see what was. Very interesting. I love my machine and I thank all those 'pioneers' for making it possible to create lovely things in my own home. My mother had a treadle sewing machine. She would release the belt to the machine and let me pedal to my little hearts content. I learned to sew with that old machine. Then in "home ec" in school there was nothing but treadle machines. I am so happy I have those memories. I am also so happy to have my computer sewing machines. They have made so many things simpler. What a cool view of days gone by. I can only wonder what the next 100 years will bring.